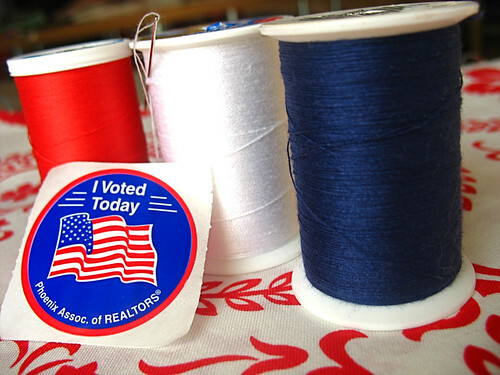 Smock the vote - Stop staring and start sewing! Well we got up and voted in the dark (in reality, not metaphorically). We were 15th and 16th in line and by the time they opened the door there were countless people in line behind us. I even saw my friend Patrick in line. He's my favorite Walmart greeter and he's voting for the other guy. I hope my guy wins or else he'll be like "Welcome to Walmart....loser." (he'll probably even make an "L" with his fingers up on his forehead). I may have to start using the other entrance. Anyway, let's talk about winners now! The winner of Big Grand Finale Super Fun Pack of Fabric Goodness (or BGFSFPFG for short!) is Rebecca who left a comment on 11/2 at 4:04 pm. Yippy for Rebecca!! I've been trying to get back into the swing of things (or should I say sewing of things?) here. I'm working on some pretty dresses (for a wedding!) and I'll give sneak peeks soon. I hope you're all having a great week!